Living in NYC, I have access to all types of authentic food from all over the world. If you ask me what is my all-time favorite type of cuisine, I’d tell you Indian food. There is something about the the layers of flavor in these dishes that grabs me. Whether you choose a spicy Vindaloo or a mild & creamy Tikka Masala, the complexity of the flavors are great. With this recipe I utilized a “base” curry sauce, aside from the other ingredients that went into this Vindaloo recipe. The result was my best Indian dish to date. It had very good heat, without it being overwhelming and the flavors were balanced and delicious. On the occasions I’ve had this at a restaurant it was usually prepared with shrimp, chicken, or lamb. 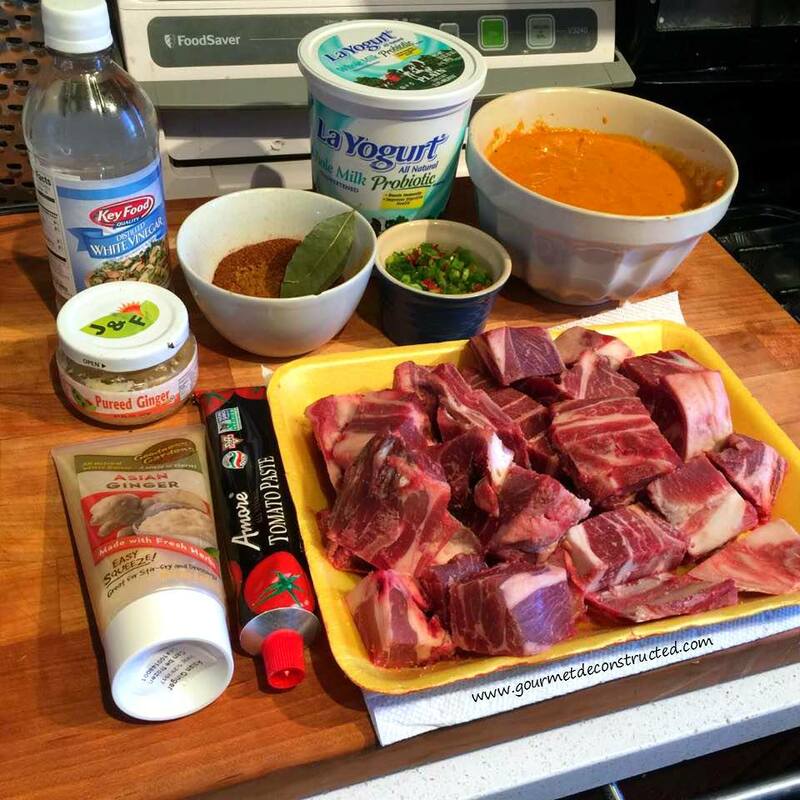 I decided to use goat for this recipe for a more unique flavor. I also cooked this in a slow-cooker to allow the goat meat to tenderize so it would be fall off the bone delicious. Quite a few ingredients go into this dish but in the end it is all worth it. Enjoy! *Note: Freeze any remaining curry for up to three months. Heat the oil into a large heavy bottomed saucepan and heat over medium high heat. Add the sliced onions and Sauté, stirring frequently, until the onions are soft, lightly browned and translucent. Add the bell peppers, carrots, and cabbage then stir to combine. Sauté for a further five minutes and then add the ginger and garlic purees and the all of the spices except for the turmeric. Throw in the tomatoes and 2 cups of vegetable stock to cover the vegetables and simmer for about half an hour. After 25-30 minutes, remove the mixture from the heat and allow it to cool. Using a handheld blender, blend the ingredients until you have a smooth sauce. Melt the ghee in a frying pan and add the turmeric powder to the ghee until it darkens. You want to brown it for about 30 seconds being careful not to burn the turmeric. Incorporate the turmeric/ghee mixture to the sauce and bring to a boil again. Once it is bubbling away, turn down the heat and simmer for a further 20 to 30 minutes. Store in the fridge for up to three days or freeze portions for up to 4-5 months. In a heavy bottomed pan over medium high heat, brown the goat meat and set aside. Heat the ghee over medium heat and allow it to sizzle for about a minute and then add the spices and stir frequently. The curry will darken as the turmeric fries away. 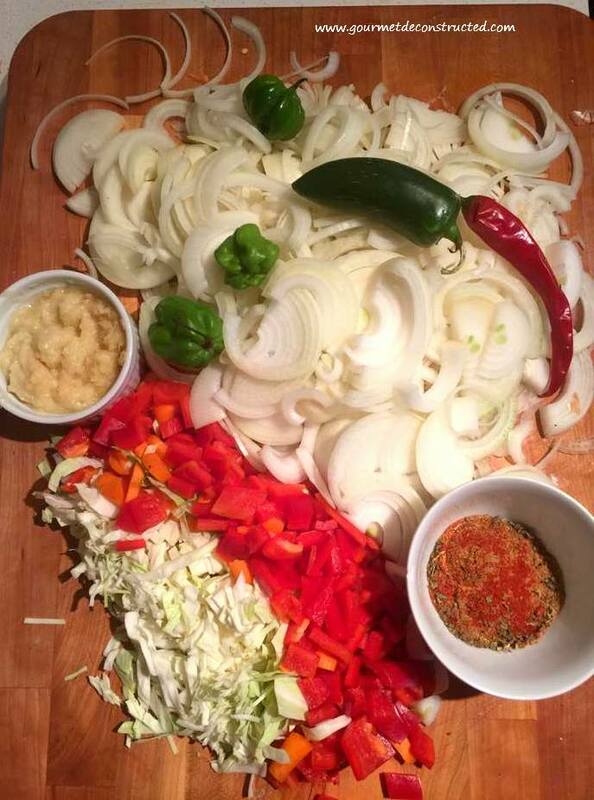 Now scoop in the garlic and ginger along with the chopped hot peppers. Add the heated curry sauce, stir to combine while adding the goat pieces. Stir in the yogurt one tablespoon at a time followed by the vinegar and tomato paste. Add all ingredients to a slow-cooker a cook on low for 7-8 hours, add the cauliflower florets to the curry for the last 45-minutes. Check for seasoning and add salt and pepper, to taste. Garnish with a spoonful of yogurt and the chopped cilantro and serve with Naan. Bon Appetit! 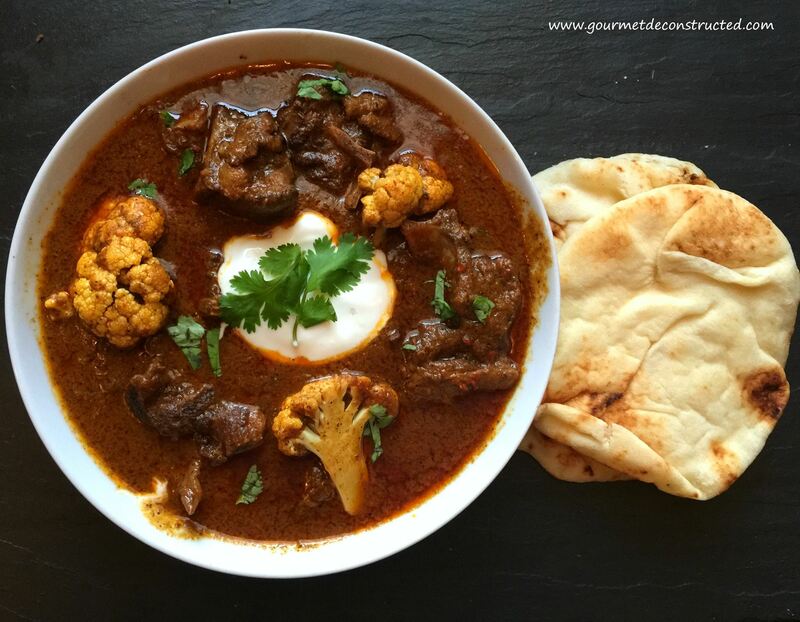 Posted on March 12, 2017, in Wild Game and tagged cauliflower, curry, goat, Hot chilis, Indian food, madras curry, scotch bonnet, spicy curry, spicy food, vindaloo. Bookmark the permalink. 1 Comment. Sounds delish, Chef! I’ll be trying this one for sure! Good stuff!